The design for the new Civic Offices for Cork City is the product of a ‘Design and Build’ competition set by Cork City Council in Feb 2004. The project was completed in Feb 2007. 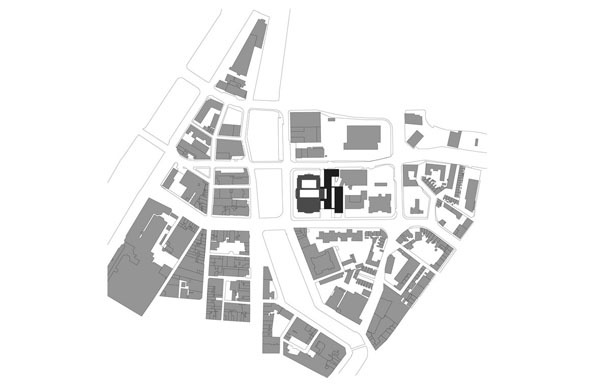 The brief required that the successful scheme maximise the economic potential of the site while providing an administrative building of the highest quality. The completed building provides 9,200m² of office space, together with 140 car park spaces at basement and roof top levels. The site was a surface car park located to the rear of the existing 1930s City Hall located on the edge of Cork city centre. It is bounded by a fire station and multi-storey car park to the south, the City Hall to the north, and two busy roads to east and west. The three facades of the existing City Hall provide independent access to a variety of civic functions: a concert hall accessed through the north façade of the existing building facing the River Lee, a Lecture Hall accessed from the east, and the Council Chamber entered from the west. Strategically, the building creates a new administrative entrance for the council to the south, ‘revealing’ the ‘back-stage’ elevation as the new, fourth facade to visiting public. 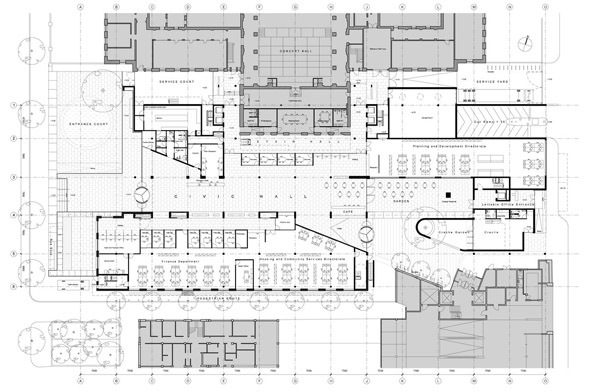 The project is structured around two dramatic spaces: a top-lit Civic Hall and a narrow Stair Hall, formed between the existing classical façade of the City Hall and the new building. The Civic Hall, conceived as a new heart to the City Hall, engages in an existing diagonal public route across the site, forming a new covered street for the city. The space is of a scale and dimension equivalent to that of the existing Concert Hall. Approached via a gently inclined forecourt, the stone-paved Civic Hall extends the city pavements for the citizens of Cork, allowing this administrative centre to become an event within urban fabric, a place for the citizens to conduct business and to witness the process of local government in action. The space also serves as a ‘grand foyer’ to the concert hall. Here, the public can gather during intervals in performances, receptions can be held, and exhibitions displayed. The Stair Hall, separated from the public atrium at ground floor by an enfilade of glazed meeting rooms, which mark the meeting of public and administrative space, contains the principle vertical circulation. This hall acts as the principle orientating space for staff, connecting the various levels, and facilitating social interaction. This hall reveals the fourth elevation of City Hall and marks the meeting of new and old. The building form is composite, consisting of masonry and glass volumes. It forms a bridge between the set-piece of City Hall and the freestanding blocks that stand along Eglington Street and Anglesea Street. The solid, ‘masonry’ block is conceived of as a carved volume, eroded in response to the adjacent City Hall and city edge condition. 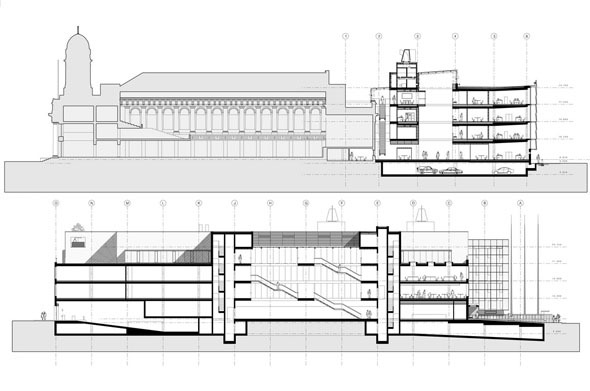 It embraces or ‘clasps’ the projecting backstage of the City Hall, forming a link with the existing structure. L-shaped in plan, it creates a new street edge to the east and a central court into which projects the curved form of the crèche garden. It also fulfils the function of a ‘service block’, containing the principle services for both the existing City Hall and the glass volume – lifts, plant, canteen, staff resource centre, Comms room. The crystalline volume is designed for maximum flexibility and contains office space. It is linked to the service block by bridges for circulation, great ‘chimneys’ for ventilation, and deep fins to control light. This volume is linked by a bridge to an adjacent car park, which provides vehicular access to 40 parking spaces on the roof. This translucent addition to the city is conceived of as a lantern – a visible expression of the ethos of openness, transparency, and accountability of the City Council. The form of the building and the internal spaces are the product of a holistic environmental strategy, which integrates the latest technology to create a good working environment. The office floor plates are typically naturally ventilated. 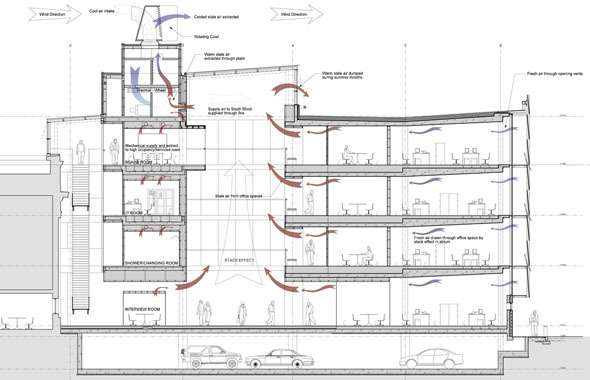 The Civic Hall acts as a return plenum for adjacent offices while fresh air, collected at roof level using rotating wind cowls, is supplied via large ‘chimneys’ in the roof and walls of the Civic Hall through the floor plenum to the offices. Free heating and cooling are provided using ground water, pumped through pipes embedded in exposed concrete soffits. These soffits are tilted towards floor-to-ceiling glazing to maximise daylight penetration, creating dynamic working spaces. The outer glazed façade is fritted with a graded pattern to give shading from the sun. Designed as a buffer from wind and city noise, the double facade also generates a microclimate, allowing staff to open perimeter windows during the coldest months. 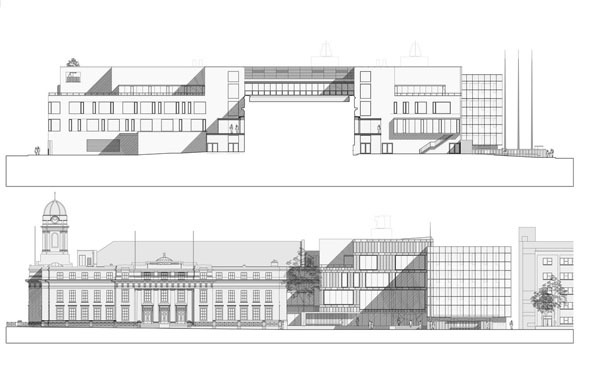 The façade of the building forms a unified composition with existing structures. Fenestration along Anglesea Street changes from the regular elevation of City Hall to the random and ever increasing glazing of the masonry block to end in the transparent volume of crystalline block -an expression of ever increasing openness and transparency of the Local Authority. The use of white Carrara marble, sympathetic to the indigenous stone of Cork, celebrates the building’s civic status, placing the building in the tradition of civic buildings from Santa Maria Del Fiore to San Miniato al Monte.